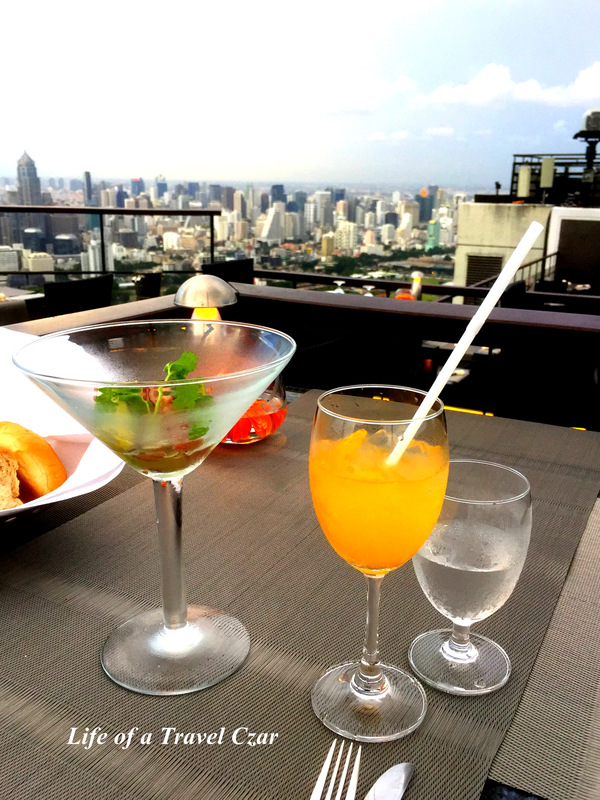 So its my final night in Bangkok and I decide to have dinner and drinks at my hotel. 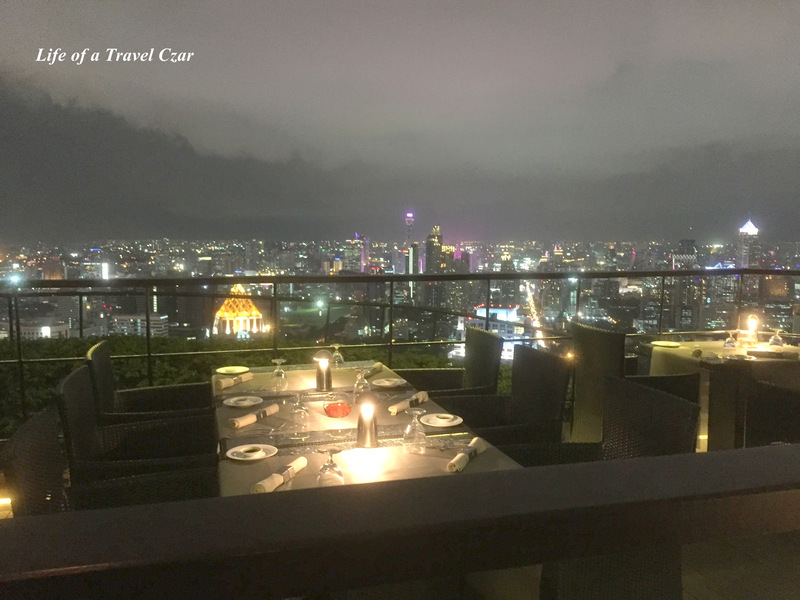 I head for the rooftop bar and restaurant which is perched in the clouds (well almost)… at 61 floors above the city it offers the best view of Bangkok and an amazing dining experience. 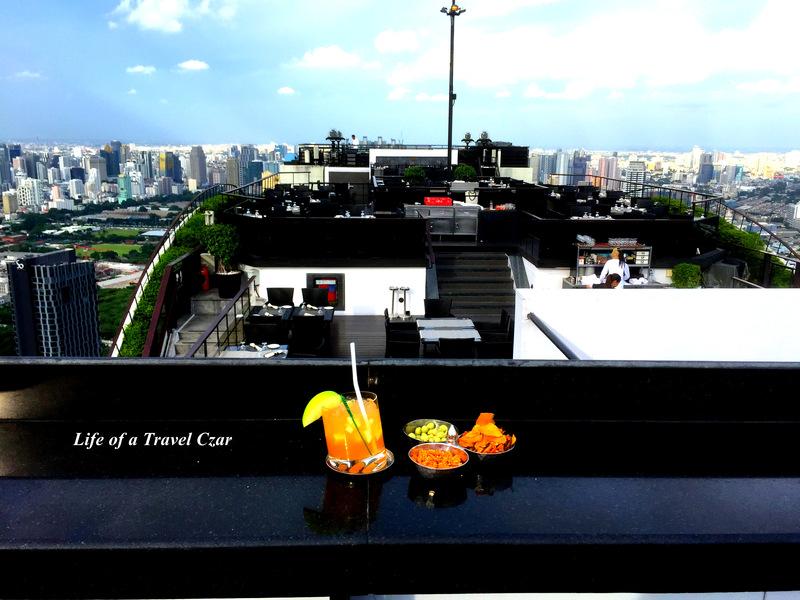 The restaurant is Vertigo and there is a casual bar next to it, the Moon Bar which span the entire rooftop giving you uninterrupted views of the city. 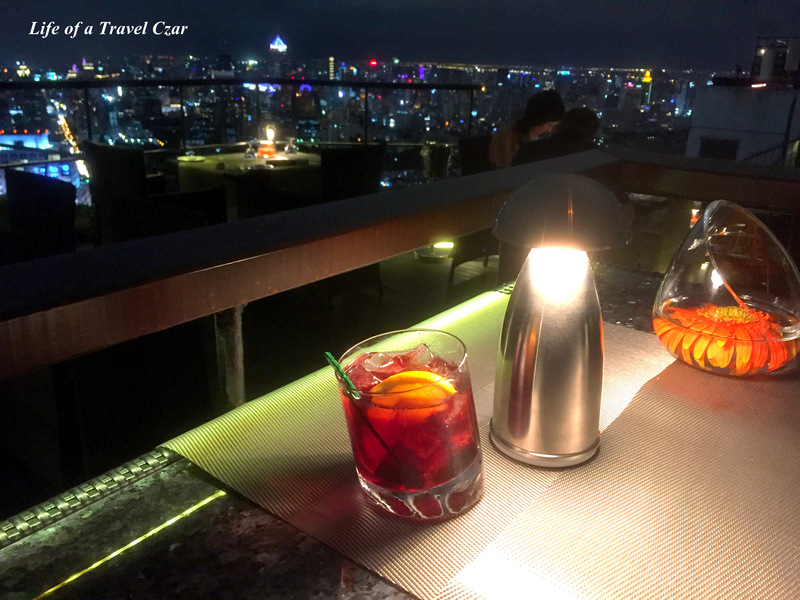 I start with a cocktail at Moon Bar. Beautiful sweet fruity cocktail with some bite from the bitters to kick-off proceedings. 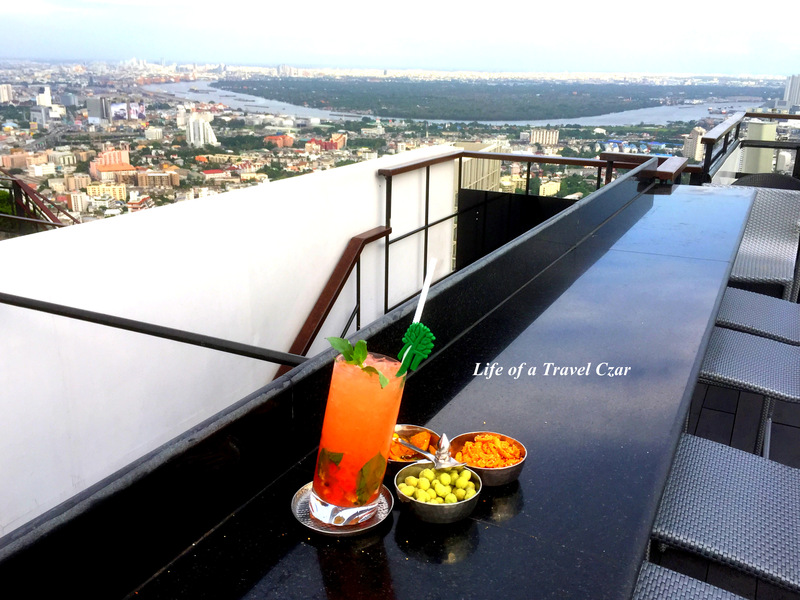 This cocktail is lovely with a mix of herbiness from the basil, sweetness (Raspberry and Watermelon) and tangy streak (Passionfruit and lime) with the hit of the rum which sails through at the end to dazzle you! I continue to gaze at the view and nonchalantly pass the time until I am ready for dinner. It is quite a sight! 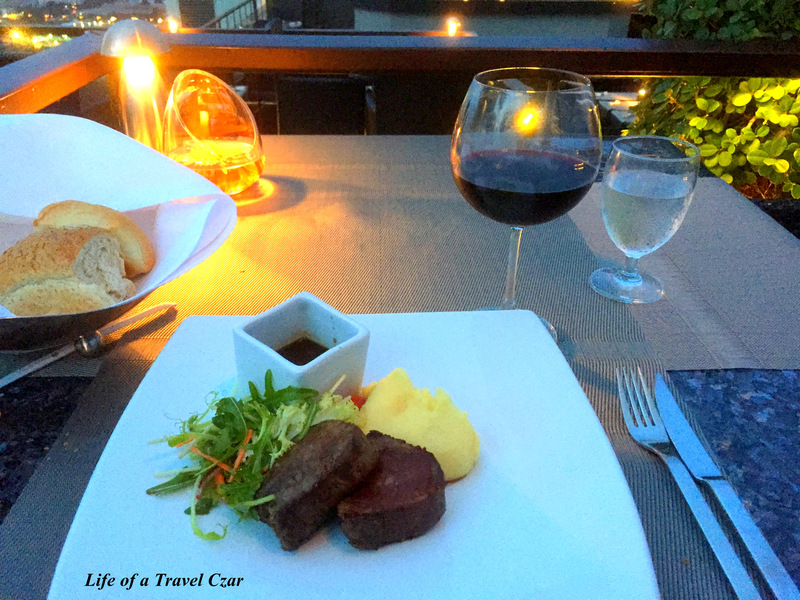 Eventually I am seated at my table and I choose to order from the set menu… here is how the evening unfolded. 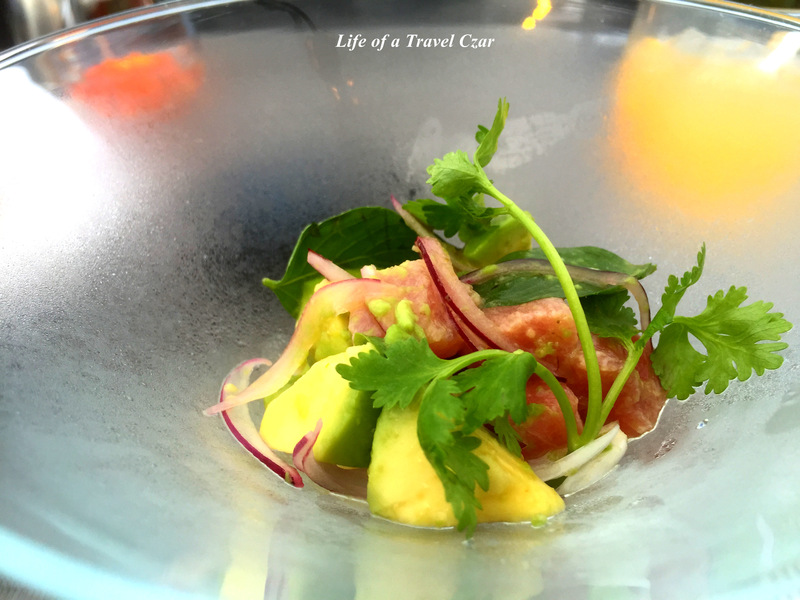 The oily succulent tuna meat is a dream and is paired with the mild flavoured guacamole mixed with the spicy seasoning to provide some balance with citrus bite of the lemon rounding out the finish. A truly refreshing entrée to start the evening and perfectly suited to the tropical weather although the caviar seemed to lack its distinct flavour and was possibly lost in the dressing. 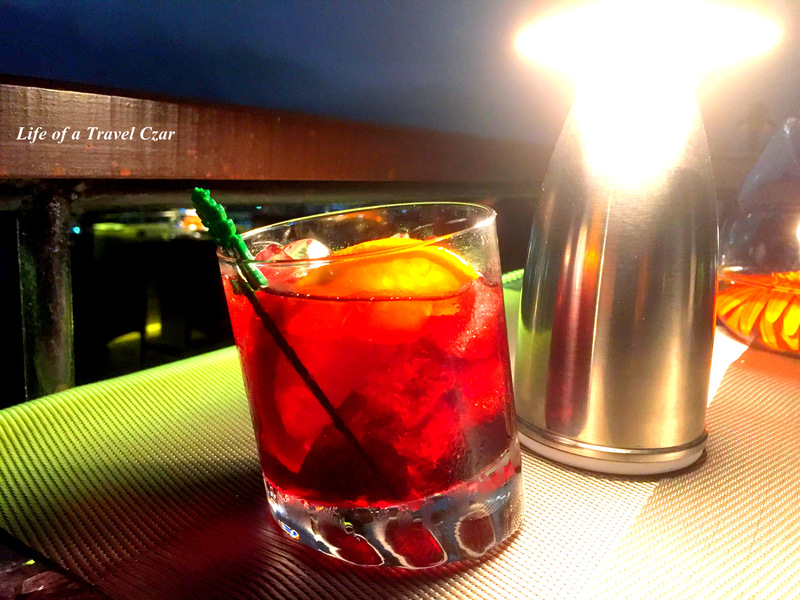 The cocktail is a delight as the sweet citrus flair of the orange and pinot grigio shines in the drink with some mild drawback on the plate from the ginger and lemongrass. The citrus perfectly cuts through the fattiness of the tuna. 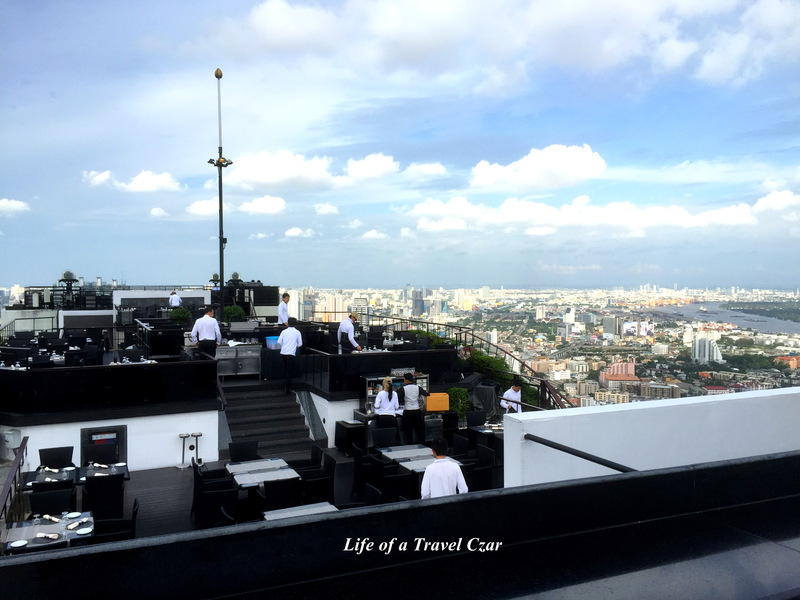 Its such a relaxing way to start the evening and the view of the building tops certainly make you feel on top of the world! The presentation of this dish is perfect. The dish is brought out in a tray with a silver cover to match. 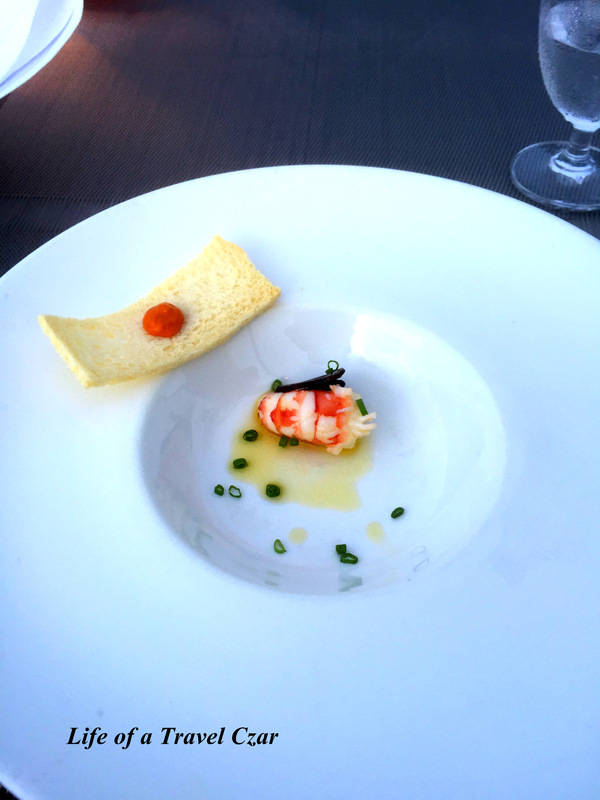 The beautiful “almost naked” lobster sits in the middle of the porcelain white dish staring at you. 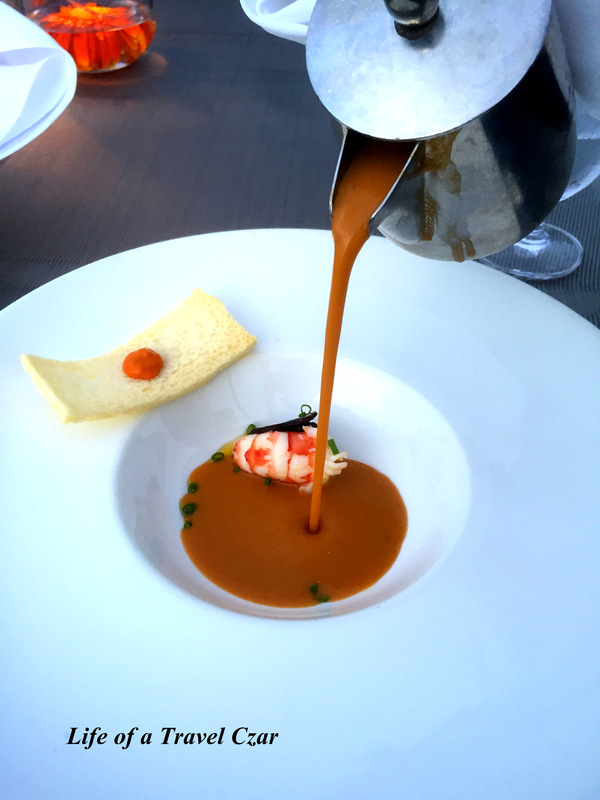 Then the creamy thick bisque is poured in front of you to clothe the main course with its well deserved velvety robe. The dish is rich. 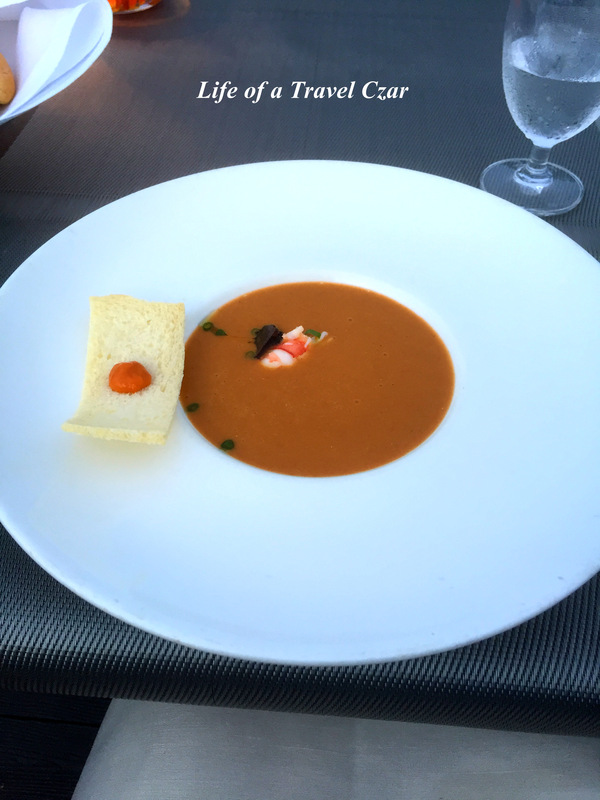 The creamy thick bisque has a wonderful consistency and reflects the juices of the lobster. The succulent lobster displays its natural flavours oh so eloquently and the crispy croutons add a lovely contrast of textures to smoothness of the dish. The rouille adds an intense flavour burst in the finish to round out the dish. 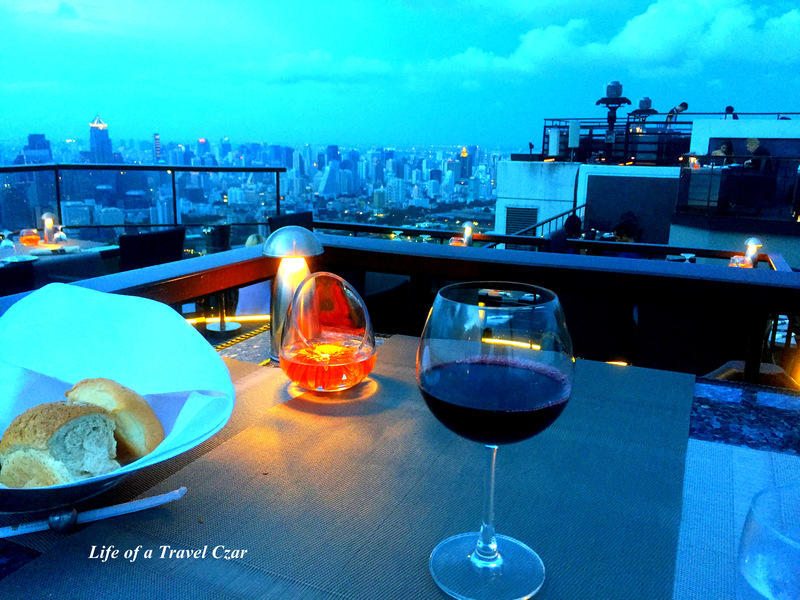 As I finish the dish and recover from its grandeur, I gaze across the Bangkok skyline and see the sun escaping into the distance. 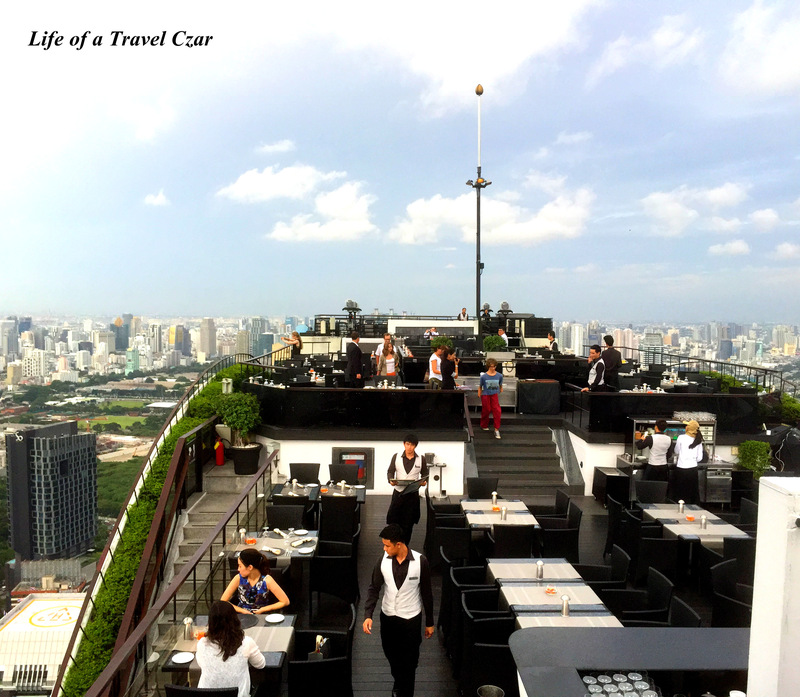 Its radiant glow is replaced with the sparkle of the lights in offices which cover the Bangkok skyline. Its such a beautiful sight. 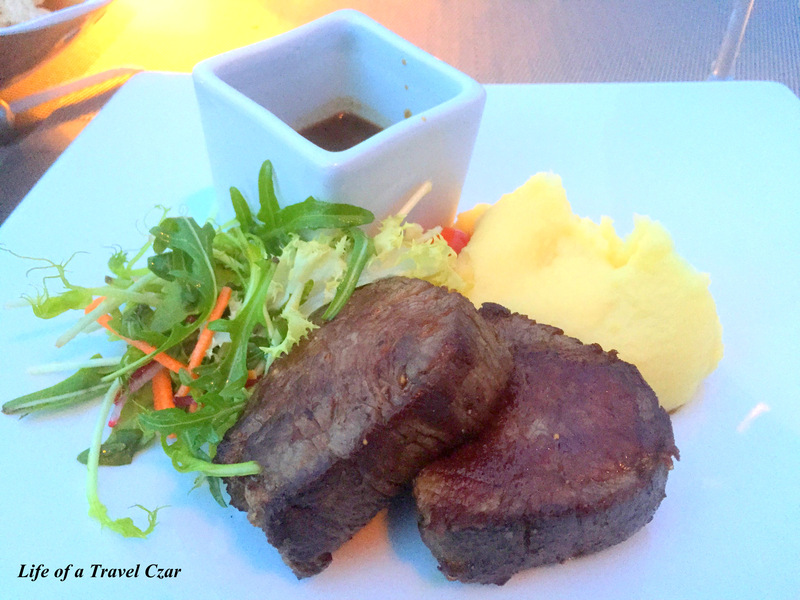 The beautiful succulent beef, with its strong natural flavours and rich juices pair well with the mild mushroom béarnaise sauce which adds some additional moisture and earthiness to the dish. The salad and fluffy potato adds a lovely base to the dish, which is executed well. The wine partners well with the beef. The beautiful aromas of berries, plum and cherries lead on the nose with hints of sweet spice. On the palate the Shiraz displays the beautiful full fruit flavours with great expression while the spicy zest in the finish and youthful tannins balance the initial fruit intensity. The dessert is quite standard. 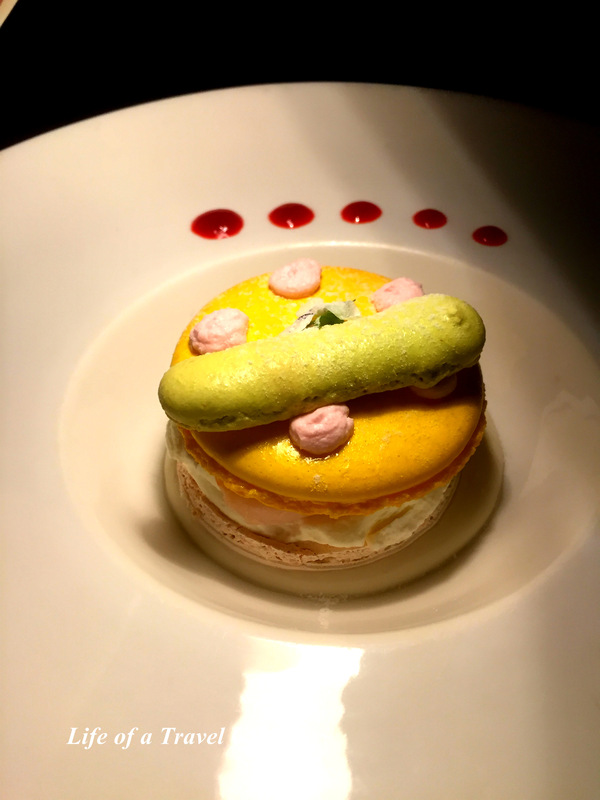 The sugary flakey and crispy macaroon sends a sugar rush through the bloodstream. 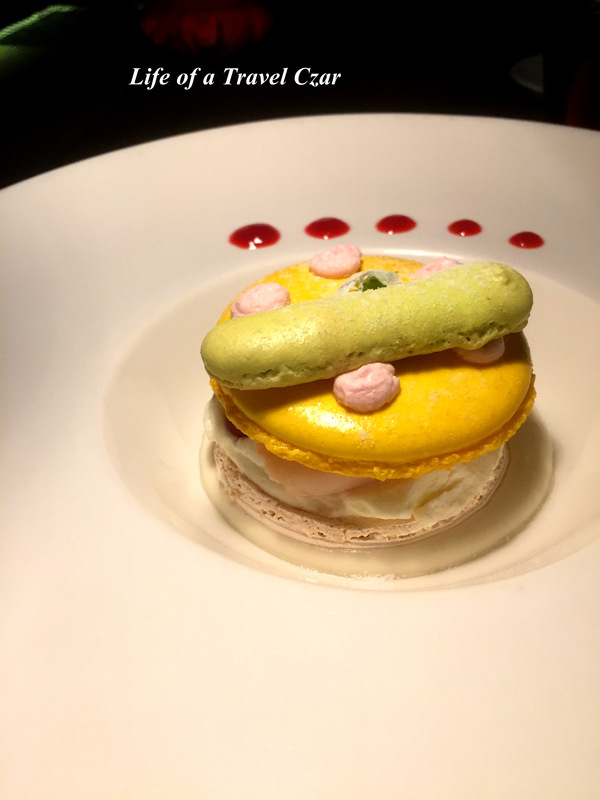 The lychee (hidden underneath the macaroon) adds a wet and soft contracts to the crispness of the macaroon, while the bite of the ginger balances the overall sweetness of the dish. The honey angalise sauce provides a rich streak to round out the flavours in the dish. The cocktail is a typical wind-down… nothing special, with the bitter strength of the bitters and Cointreau to provide a harsh tonic to definitely make you ease into your hotel bed. 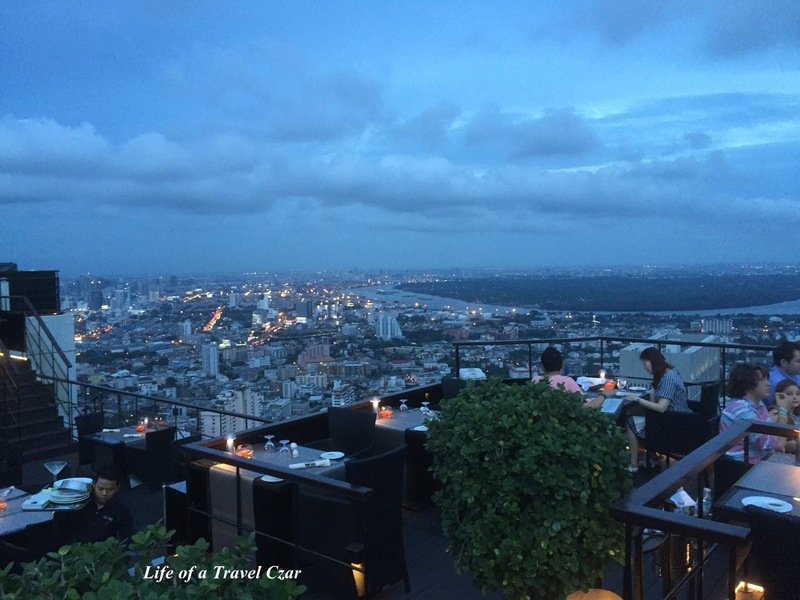 Such ends a perfect night over the city of Bangkok! Just loved it. I gaze once more that the stunning view to finish the night.